Filipino Style Recipe: Seafood salad with lime dressing is another type of salad consists of seafood, celery, tomatoes, onion and parsley then tossed in lime dressing. 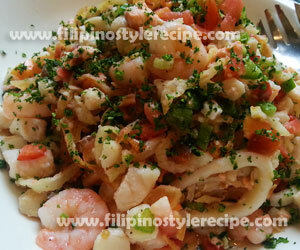 Seafood salad is a simple and easy to prepare dish. This is commonly served as appetizer and ideal for those on diet and health-conscious. 1. In a shallow bowl, combine dressing ingredients. 2. Season tuna with a dash of salt and pepper. Set aside. 1. In a frying pan, heat oil then cook tuna for 3 minutes or until done. Drain and set aside. 2. In a pot, bring water to boil. Add a dash of salt then boil shrimps for 2 minutes. Drain and set aside. 3. In a same boiling water, boil squids for 3 minutes. Drain and set aside. 1. In a large bowl, combine seafood and the rest of ingredients. 2. Pour lime dressing over the salad then toss and sprinkle with parsley. Serve. 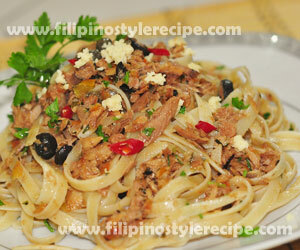 Filipino Style Recipe: Spicy tuna pasta is another easy and simple pasta dish. It is consists of sauteed spicy tuna flakes with tomatoes, chili, garlic, onion and parsley then stir cook together with pasta until done. Spicy tuna pasta is usually serve as meryenda(mid-afternoon snack) or in any special occasion. 1. In a large pot, prepare the pasta based on cooking instructions. Drain and set aside. 1. In a pan, heat olive oil then saute garlic and onion until translucent. 2. Add tomatoes and tuna then continue sauteing for 5 minutes. 3. Add black olives, capers and chili then season with salt and pepper. 4. Add pasta and parsley then stir cook for a minute. Turn off the heat. 5. Arrange spicy tuna pasta into serving plate then sprinkle remaining parsley and top with grated cheese. Serve! 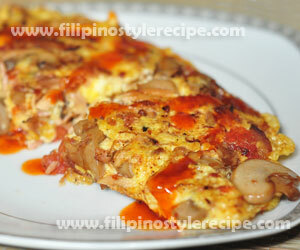 Filipino Style Recipe: Tuna and mushroom omelet or omelette is an easy yet delicious breakfast recipe. It is consists of beaten eggs, tuna flakes and mushrooms then cooked until set. Then usually serve during breakfast with fried rice. 1. In a bowl, beat the eggs and milk together until frothy then season with salt and ground pepper. Set aside. 1. In a nonstick frying pan, heat butter over medium heat. 2. Saute onions, mushrooms and tomatoes for 3 minutes or until soft. 3. Add tuna flakes and ground pepper, continue sauteing for another 3 minutes. Strain and set aside. 1. In a same pan, add butter, half of tuna-mushroom mix then pour half of egg mixture. 2. Sprinkle with grated cheese then cook until bottom is golden. 3. Gently fold omelet over then carefully slide omelette onto a serving plate. 4. Garnish with parsley then serve with hot sauce! 1. You may include bell peppers and zucchini sliced thinly in omelette filling. 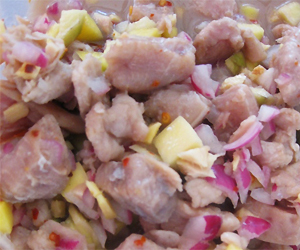 Filipino Style Recipe: kinilaw na tuna is a raw fish salad made of fresh tuna mixed with vinegar, garlic, onion, ginger, calamansi juice, salt and pepper. This dish is another Filipino delicacy and usually served as appetizer or pulutan. Make sure it is fresh because the taste of kinilaw is depends on the freshness of the fish. 1. In a bowl, combine cubed tuna and vinegar then mix well. 2. Let stand for 2 minutes then drain vinegar. 3. Add the remaining ingredients then mix well. 4. Cover and refrigerate for 30 minutes. Serve chilled with beer. 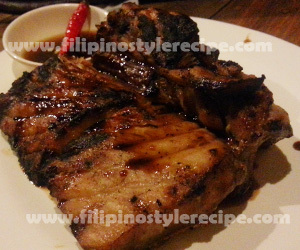 Filipino Style Recipe: grilled tuna belly is another easy and mouth-watering grilled dish. This is usually made of tuna belly marinated then grilled until done. Serve with soy sauce, calamansi juice and red chili then usually served as appetizer or pulutan. 1. In a bowl, combine marinade ingredients then marinate tuna belly for at least 1 hour. 1. Remove the tuna belly and then reserve the marinade. 1. Grill marinated tuna belly over hot charcoal for 3 minutes each side or until tender while basting with marinade mixture. 2. Transfer serving plate and serve with steamed rice and spicy tuyo-mansi. 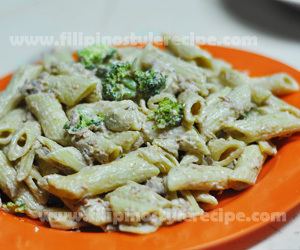 Filipino Style Recipe: tuna penne with broccoli is another easy yet delicious pasta dish. It is usually consist of pasta and a creamy white sauce with tuna and broccoli. Estimated time of preparation and cooking: 15-30 minutes. 2. Add broccoli then cook in a boiling water for 1 minutes or until tender. Drain and rinse with cold water. 2. Add tuna, bell pepper and black olives. 3. Pour chicken stock and bring to boil. 4. Add evaporated milk, cheese and basil. 5. Season with salt and pepper. Mix well. 6. Prepare pasta on pasta tray, pour the sauce, broccoli, grated cheese and dried basil. Toss together then Serve! 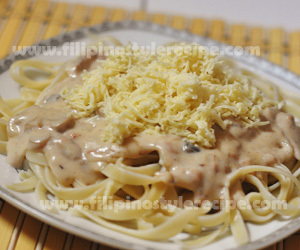 Filipino Style Recipe: tuna and mushroom pasta is another easy yet delicious pasta dish. It is usually consist of pasta and a creamy white sauce with tuna and mushroom. 2. Add bell peppers, mushrooms and tuna. 6. Prepare pasta on pasta tray, top with the sauce, grated cheese and dried basil. Serve hot! 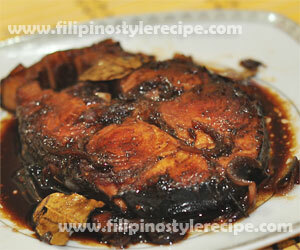 Filipino Style Recipe: adobong isda or fish adobo recipe is another simple yet delicious dish. Usually the fish marinade, fried then simmer in a blend of soy sauce, vinegar, sugar, salt and pepper. 1. In a bowl, combine fish, garlic, soy sauce, vinegar, salt and pepper. 2. Marinate for an hour in the refrigerator. Drain fish and reserve the marinade. 1. In a frying pan, heat oil and fry the fish until golden brown on both sides. Drain and set aside. 1. In a sauce pan, heat oil and saute the garlic, onion and ginger. 2. Pour marinade then bring to boil. 3. Add fried fish and bay leaf then simmer for 8 to 10 minutes. 4. Adjust the taste according to taste. 5. Remove from heat and transfer to a serving plate. Serve with steamed rice.